“Ego Dominus Tuus” comes as a huge surprise. 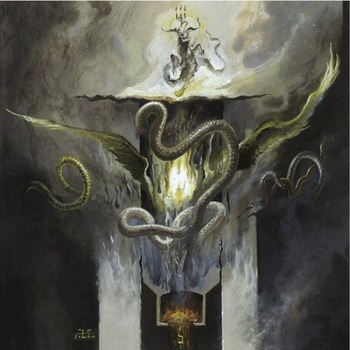 With their previous release “Hierophany Of The Open Grave” (2011) NIGHTBRINGER succeeded to raise an eyebrow or two in Europe, but the old world was rather busy with sufficient orthodox Black Metal of its own. This is about to change. Sure, the elements that “Ego Dominus Tuus” is made of are well known. There are obvious traces of EMPEROR,DARK FUNERAL and DIMMU BORGIR among other black classics to be found on the American’s fourth full-length. Yet NIGHTBRINGER have created dark and gripping music that is clearly bigger than the sum of its parts. Their songwriting is flawlessly elegant and easily carries even through songs of epic duration without a single second wasted. When NIGHTBRINGER were founded, the band was created as a conduit for contemplations on the mysteries of death as it is understood in the tradition of the magical arts. 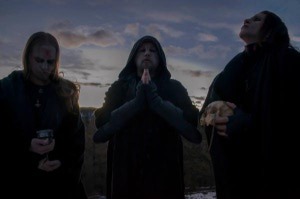 Formed in the year 1999 by Naas Alcameth (guitars and vocals) and former member Nox Corvus (guitars, percussion and vocals), the band from Colorado in the United States chose Nordic Black Metal as the foundation of their artistic expression. NIGHTBRINGER are still holding up the traditions of second generation Black Metal, while adding their own unique sinister sound. After unleashing several demos and split releases between 2001 and 2006, their debut album “Death and the Black Work” darkened the light of the world in 2008. A second album followed two years later with “Apocalypse Sun”. Rising from the US underground, NIGHTBRINGER found themselves opening for major acts of the scene such as WATAIN, KRIEG and PROFANATICA and in 2014 crossed the Atlantic for a small tour reaping strong praise from the initiated. Now it is time to listen to NIGHTBRINGER again without prejudice and discover the remarkable strength of “Ego Dominus Tuus” that will lead them to the elite circle of American black metal!